PE6210 25 Watts RF load (also known as termination or dummy load) has a 7/16 DIN connector that is female. 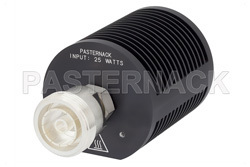 This Pasternack 25 watts 7/16 DIN female load / termination is rated for a maximum frequency of 8 GHz. Our 7/16 DIN female termination load is a rf load termination with a 50 Ohm impedance. This 7/16 DIN load / coax terminator is manufactured with no chain and brass body. 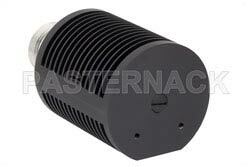 Pasternack 50 Ohm 7/16 DIN coaxial termination / load is RoHS compliant and has an average maximum VSWR of 1.6:1. PE6210 25 watts 7/16 DIN female load termination is one of over 40,000 RF, microwave and millimeter wave components in-stock at Pasternack. Our 7/16 DIN female 25 watts termination load will ship worldwide the same day as purchased.